Over the past two decades, Australian Jews have been at the center of significant Australian political and ideological debates, including: the War Crimes legislation and the associated Helen Demidenko controversy; anti-vilification legislation and broader concerns over multiculturalism and racial tolerance; and the on-going Israeli-Arab conflict, and its local manifestations such as the recent Hanan Ashrawi and Sydney Peace Prize affair. There is a strong public perception that Jews are an influential group in terms of their social and economic resources, and access to key political groups and players. In particular, popular literature portrays Australian Jews monolithically, as speaking with a single voice rather than as a diverse community with many different factions and perspectives. There has been little informed, research-based analysis of the political activity and allegiances of Australian Jewry. Scant attention has been paid hitherto to the particular factors and forces that determine Jewish political activities and agendas: the impact of socio-economic and organizational structures of the Jewish community, and the controversial question of "who speaks for Australian Jewry? "; the local and global influence of universalistic values and ideologies such as liberalism, conservatism, socialism, Zionism and anti-Semitism; and the influence of specific Australian political issues and debates, ranging from positions on the Middle East conflict to the pursuit of Nazi war criminals and concerns over immigration, multiculturalism, and race relations. 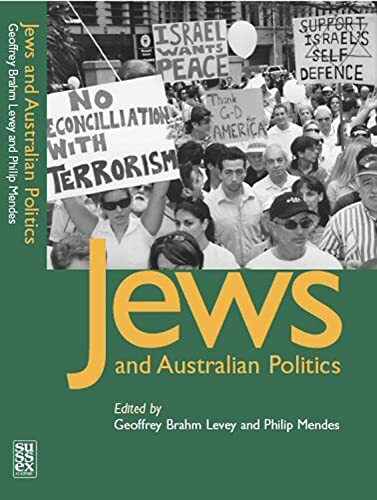 This book - an edited collection of new contributions from distinguished Australian academics - contextualizes, illuminates, and explains the contemporary politics of Australian Jewry. It critically analyzes the broad themes above through relevant case studies and source material, and situates the politics of Australian Jews through comparisons with general patterns in Australian politics, the politics of other minorities in Australia, and the politics of other Western Jewish communities. The book contains a detailed appendix of Jewish Parliamentarians, from 1849 to the present. Geoffrey Brahm Levey is Senior Lecturer in Politics &amp; International Relations, and Coordinator of the Program in Jewish Studies, University of New South Wales, Sydney. Philip Mendes is Senior Lecturer in Social Policy &amp; Community Development, Department of Social Work, Monash University, Melbourne.